I have not been too well over the last week or so, and consequently have not been very motivated with the tool set. (It requires all my concentration at the best of times.) Instead, I was able to attend a couple of IRC for the NWCon4, which were fun. And, over the last day or so, I have been putting together the first few pages of my new website to complement the next set of modules for the Althéa Campaign. Its Home Page will now link to this blog, but there will be a header with various links to different sections explaining various aspects of the campaign, including a History section, a House Rule section and an Adventure section. Each of these sections follow a similar colour format to the Blog page, and each has its own contents bar for easy navigation when trying to find information regarding the campaign. 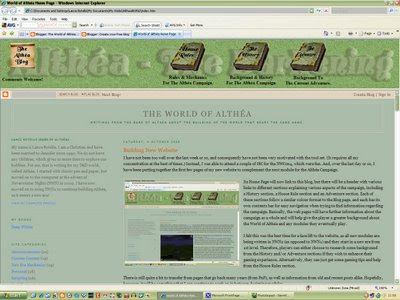 Basically, the web pages will have further information about the campaign as a whole and will help give the player a greater background about the World of Althéa and any modules they eventually play. I felt this was the best time for a face lift to the website, as all new modules are being written in NWN2 (as opposed to NWN1) and they start in a new era from 1st level. Therefore, players can choose to research some background from the History and/or Adventure sections if they wish to enhance their gaming experience. Or, they may find the House Rules section beneficial to help explain some of the unique aspects of the campaign. There is still quite a bit to transfer from pages that go back many years (from PnP), as well as information from old and recent posts alike. Hopefully, however, it will be something that I can continue to work on in between designing modules. As soon as there is sufficient material to make the website worth uploading, I will do so. I will announce it when done.